The Mist Trail lays claim to one of the finest views in all of Yosemite, this one encompassing Nevada Fall, Liberty Cap, and the less famous back side of Half Dome. And we can't forget Mt. 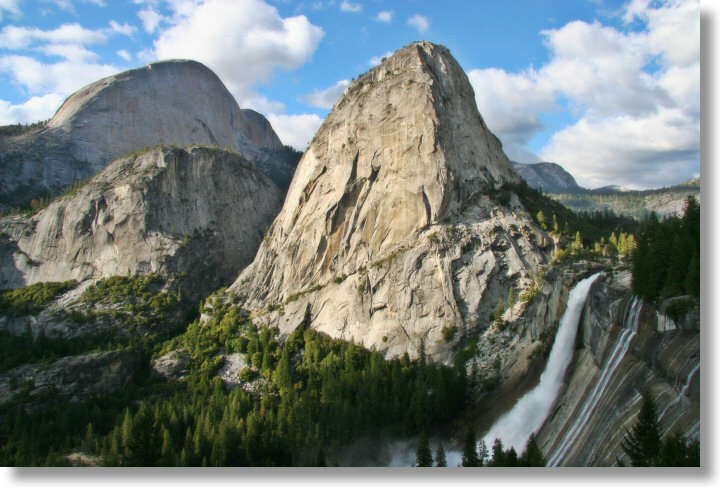 Broderick, the hump between Liberty Cap and Half Dome, named for a U.S. Senator who was killed in a pistol duel with David Terry, then chief justice of the California Supreme Court. Terry himself was killed thirty years later when he attacked Supreme Court justice Stephen Field, who had ruled against Terry's wife in an alimony suit against silver baron William Sharon. Be wary of picking on Supreme Court justices; you never know what they're hiding beneath those robes. This view, to be technical, isn't actually part of the Mist Trail. The Mist Trail switchbacks up Nevada Fall just to the left of it, between the fall and Liberty Cap, and merges with the John Muir/Half Dome trails at the top of the fall. To get here, you need to take the Muir Trail roughly half a mile out of your way to this vantage point. You can continue from here back to the trailhead - depending on which fork you take, it'll merge with the Mist Trail again either above Vernal Fall or just above the Vernal Fall footbridge. The Muir Trail route is longer and less scenic than the Mist Trail (this is the only really memorable view on it), but it's also less steep. p.s. Love this photo? You can download a free larger version to use as your desktop wallpaper.